Eek it’s almost Christmas and I still have loads of presents to buy. I’ve got a good excuse for being so behind this year but not being able to get out and shop makes it harder. I’m hoping to get some more done in the next few days. We won’t be running the linky next Friday (23rd December) to give us more time to spend with our families over Christmas but we will be back the following week (30th December). 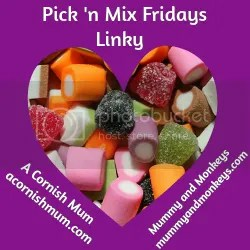 You can grab the code for our linky badge at the bottom of the post, if you need any help just shout. My fabourite post from last week was The Little Things I Love About Christmas Time by the lovely Chantal from Milk and Nappies. Her excitement in the post really rubs off on you! Link up, remember to comment on the post before yours and use the #Picknmix. 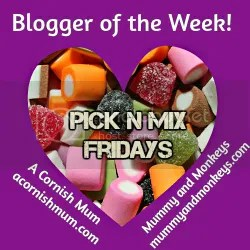 Tag me @MummyandMonkeys and Stevie @stevie_couch into your #PicknMix tweets for a retweet from both of us to our joint followers of 27k!We look forward to reading your links! You will get a visit and comment from at least one of us and many of you will be lucky enough to get one from both of us! "Personlised cushion giveaway – Mr Nutcase"
"Mustela 123 vitamin Barrier Cream"
Hi! It’s my first time linking up. Looking forward to meeting some new bloggers Thanks so much for hosting. Have a Merry Christmas!